This is a book about a terrible spate of mass violence. It is also about a rare success in bringing such violence to an end. 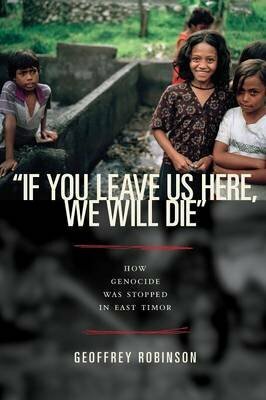 ""If You Leave Us Here, We Will Die"" tells the story of East Timor, a half-island that suffered genocide after Indonesia invaded in 1975, and which was again laid to waste after the population voted for independence from Indonesia in 1999. Before international forces intervened, more than half the population had been displaced and 1,500 people killed. Geoffrey Robinson, an expert in Southeast Asian history, was in East Timor with the United Nations in 1999 and provides a gripping first-person account of the violence, as well as a rigorous assessment of the politics and history behind it. A riveting narrative filled with personal observations, documentary evidence, and eyewitness accounts, ""If You Leave Us Here, We Will Die"" engages essential questions about political violence, international humanitarian intervention, genocide, and transitional justice.